Scientists have suggested that gardeners thwart snails chomping through their prized plants by developing a strong throwing arm. A fifth of gardeners admit to throwing snails over the fence into their neighbour's garden to get rid of them, a survey has revealed. The poll for the Royal Horticultural Society found 80% of people will be heading into their gardens this Easter to tackle spring jobs such as weeding and mowing the lawn. The survey of more than 1,500 people to mark National Gardening Week this week also found that good gardeners make good neighbours, with just 3% admitting to growing plants to block out their neighbours' gardens. But while almost four fifths (78%) said they had never thrown a snail into their neighbour's garden, 22% admitted to the horticultural crime. Experts are attempting to create a pain relief drug derived from snail venom, creating new "experimental substances". Just how quick is the average British snail? 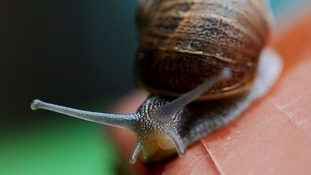 Snails are much quicker than most people think, according to a new study. ITV News Correspondent Damon Green reports. 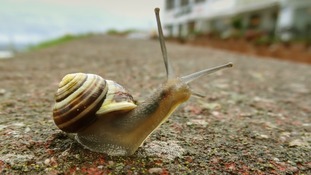 Snails can explore the length of an average British garden in a single night - reaching a top speed of one metre per hour, a new study reveals. The four researchers from Exeter University also discovered that snails move in convoys, piggy-backing on the slime of other snails to conserve energy.